After Masango surrendered his life to Christ inJuly 2005 he had a desire to know God’s Word. One of the team members gave Him a MacArthur Study Bible as he was from Zimbabwe originally and could read English. When we saw him a number of months later he had a list of questions to ask about what he had been reading in the Bible. We see how God raised this man up to pastor the church in Mabuzane as there was no leader in this church. Masango attended Christ Seminary from 2009 to 2011 and even though his academic level did not allow him to graduate, he is better equipped to pastor the church in Mabuzane and has been recognised to take on other leadership responsibilities among the greater association of Baptist Churches in that area of the Limpopo Corridor. 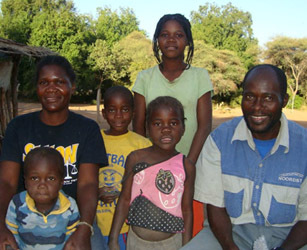 Masango’s wife, Jane, stands alongside her husband in ministry. She has had some training in starting a pre-school at the church where she will teach amongst other things basic gross and fine motor skills. Pray for them as they serve this community in teaching the Word of God.